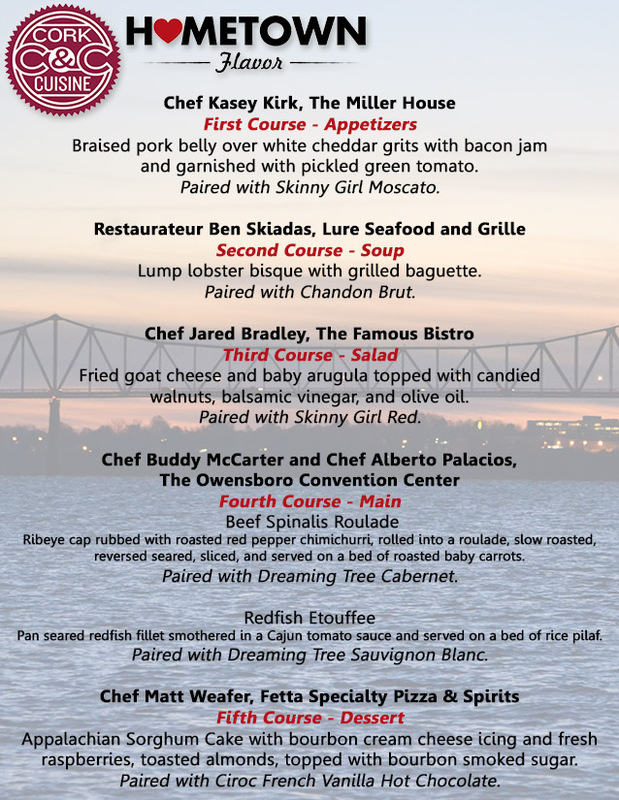 Come enjoy a 5-course food, wine, and spirits pairing event that is all about Owensboro’s Hometown Flavor! Each course will be prepared by a chef from some of your favorite local places to dine – including The Miller House, Lure Seafood and Grille, The Famous Bistro, and Fetta Specialty Pizza & Spirits! And with it being Cork & Cuisine, each course is expertly paired with a wine or spirit! See the complete menu below! Special giveaways will also be included as part of the evening, including some beautiful centerpieces courtesy of one of our sponsors, Ivy Trellis. Don’t miss this truly unique dining experience! $65.25 per person, including all wines and spirits. Reservations only. Additional processing fees apply to all ticket sales. Please note appetizer service will start promptly at 6:15pm!